Shipping World Wide from our NZ, EU and US warehouses. Earn 4.95 Weta Dollars! What's this? 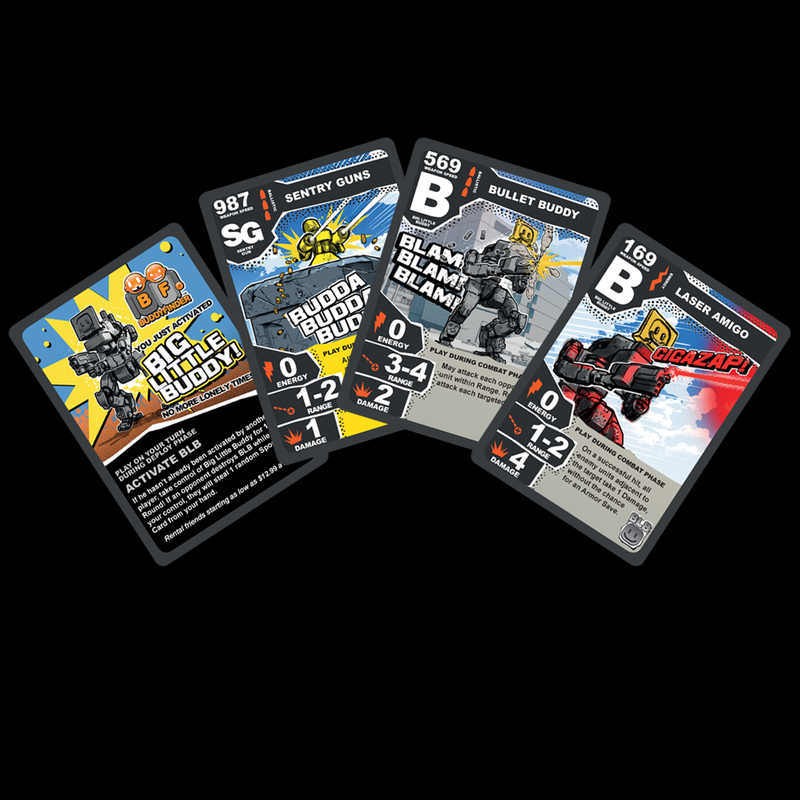 GKR: Heavy Hitters is a customizable tabletop game for 1-4 players, combining high-quality collectibles with dice-rolling, deck-building and tactical play. Pilot your Heavy Hitter (the biggest, baddest robot on the board) and a squad of three Support Units through the ruins of an old city, competing to either wipe your opponent off the map or reduce four skyscrapers to rubble! Got your copy of GKR: Heavy Hitters? 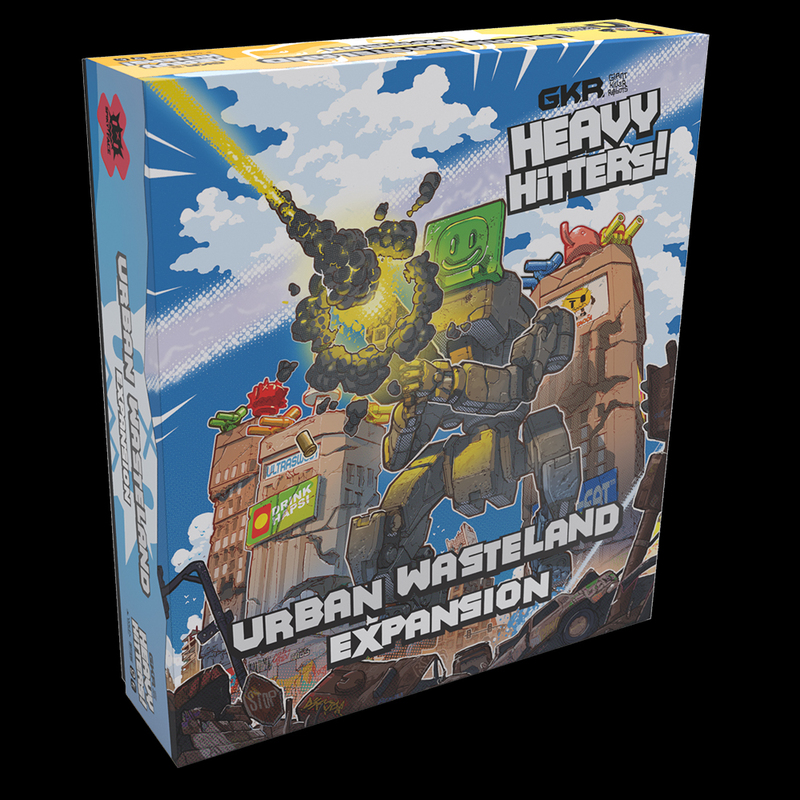 Add a bunch of corporate-sponsored bling to your game board with the Urban Wasteland Expansion, complete with a new friend - Big Little Buddy! The robot rumble never looked so appealing. In sport, there are usually a couple of big sponsors that pay for exclusive primary advertising and presence. In GKR: Heavy Hitters, Big Little Buddy is that guy. He’s made available for the match (as well as serviced and repaired after the match) by his premier sponsor – BUDDYFINDER ™. When Big Little Buddy is deployed to the gameboard, he advertises for whichever Faction has unlocked him for that round. Players can try to claim Little Buddy by playing a special Sponsor Card – a move that can only be deflected by playing a counter-hack. Once a player controls Lil Buddy, the fun begins. Move him during the Movement Phase, and use him to attack opponents in the Combat Phase with his own unique cards: 3 Weapon Cards and 1 Unit Card. Each round, he can only fire 1 of these weapons in his arsenal BUT he does not require Energy to fire. Making him really rather handy in a pinch. Once the Combat Phase is over, players lose control of him once more. Like all Units, Little Buddy can be destroyed. Once he’s destroyed, he’s removed from the game completely. 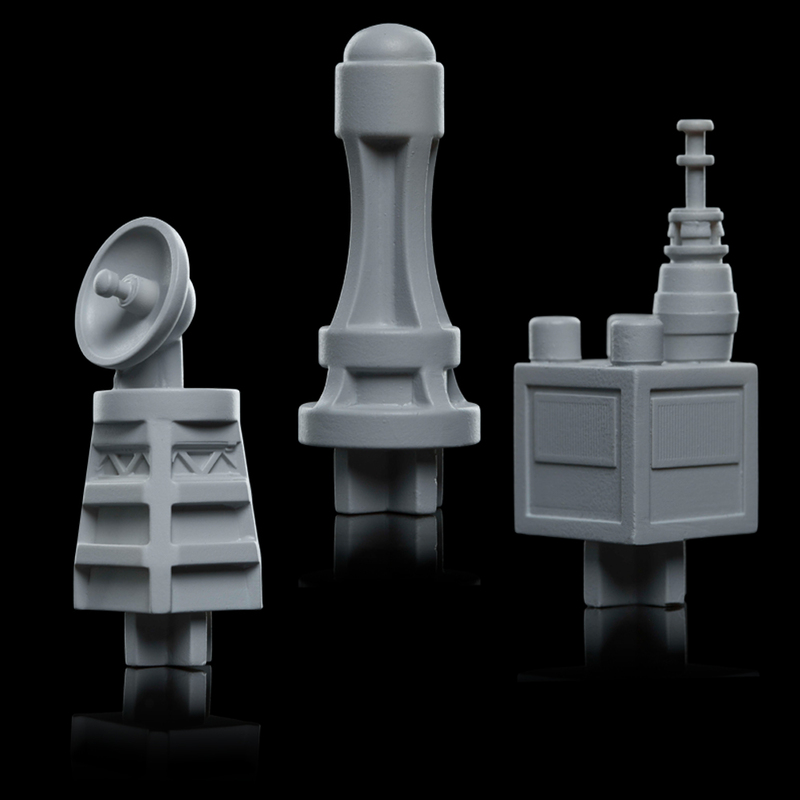 Coming your way: hardy plastic versions of the cardboard buildings in your core game box, with special “damaged” flourishes. 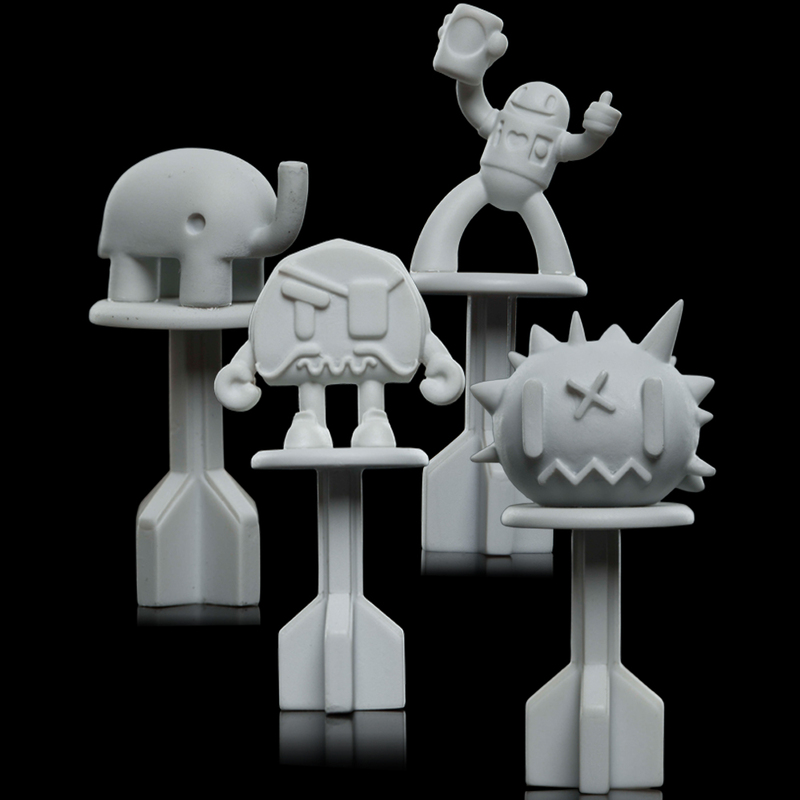 Just like the core box versions, they’ll come unassembled and designed to fit your demolition bases. These bad boys are one more step in your road to dominating the advertising landscape. Upgrade up to 3 of your existing tags with a Sentry. Beware, opponents: The Sentry Gun is always on the lookout and automatically hits anything within range. You can roll to defend yourself, though! Get in close as the only way to get rid of these guns is to over-tag them. Advertising never looked cooler. 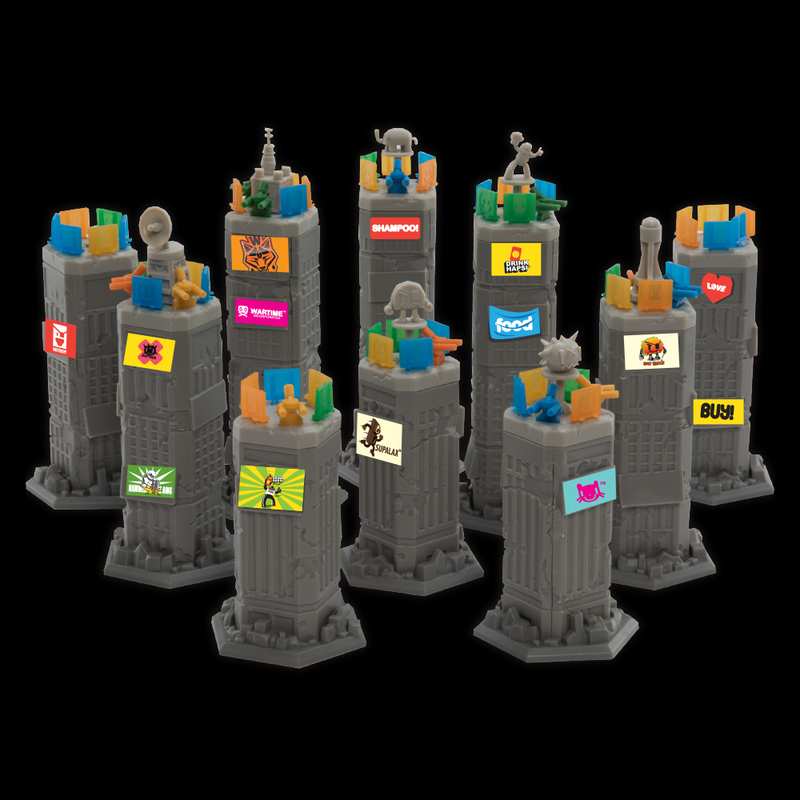 Pledge allegiance to your corporate overlords with your Bad Taco, Pink Elephant, Hapsi, and Spiky Face Building Toppers as well as 3 decorative Spires. 80 new Tags to play with! Either swap out your core game box tags or mix and match – the choice is yours. + STICKER SHEETS to customise the look of your buildings! Strap in for the most epic smackdown this side of the megapocalypse. Gather your squad of Giant Killer Robots (GKRs), build your deck, and face your rivals in the ultimate fight for fame, fortune, and sweet salvage rights! Scheme, strategize and strong-arm your way to victory as you dominate the media landscape, one billboard at a time. Note: Images shown are prototypes and digital renders - final product may vary. 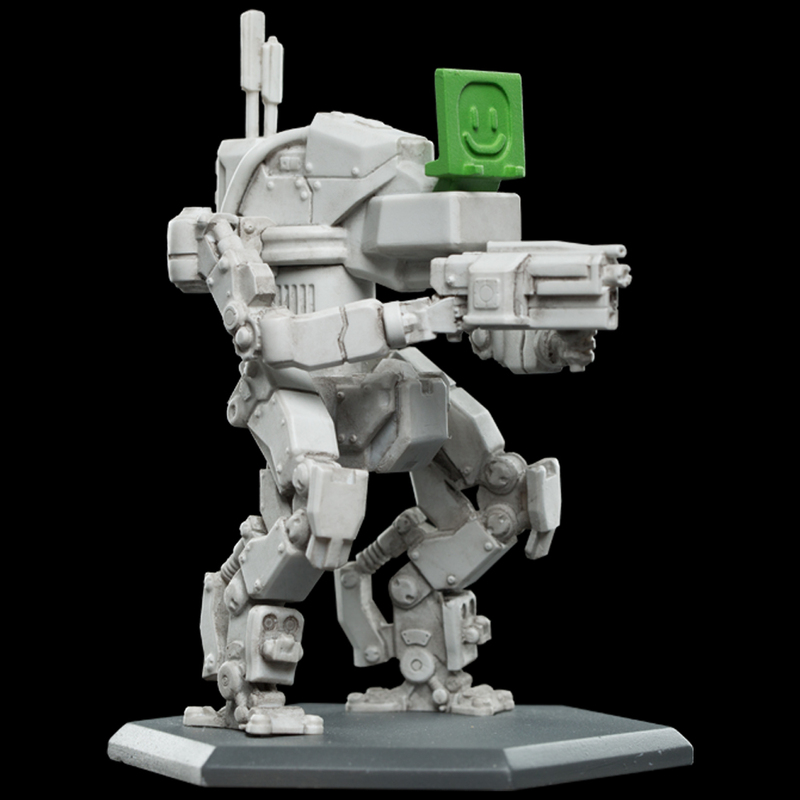 Adam Savage Checks Out Weta Workshop's "Giant Killer Robots"
From the miscreants at Weta Workshop and Cryptozoic comes Weta Workshop's first tabeltop game, set in the sports-crazy dystopian future of Giant Killer Robots. 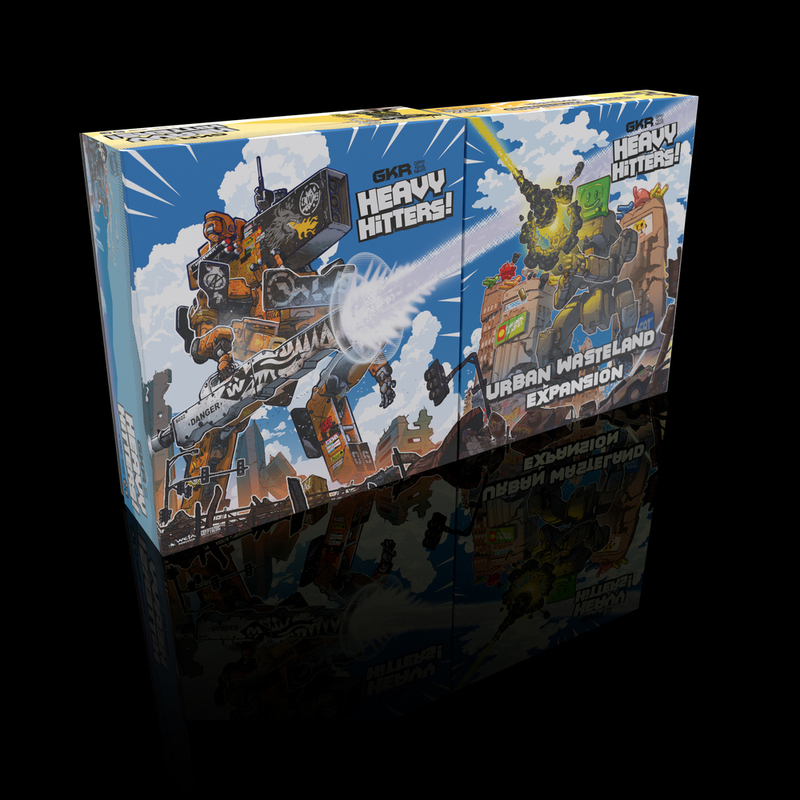 GKR: Heavy Hitters is a customizable tabletop game for 1-4 players, combining high-quality collectibles with dice-rolling, deck-building and tactical play! Pilot your Heavy Hitter (the biggest, baddest robot on the board) and a squad of three Support Units through the ruins of an old city, competing to either wipe your opponent off the map or reduce four skyscrapers to rubble! The Robot Rumble starts now. Are you in? The benevolent corporate overlords of GKR run our social media accounts with a (slightly dented) iron fist. Here's where you can find the latest updates, art, and Hapsi-fuelled humour! Give us a shout on Twitter!